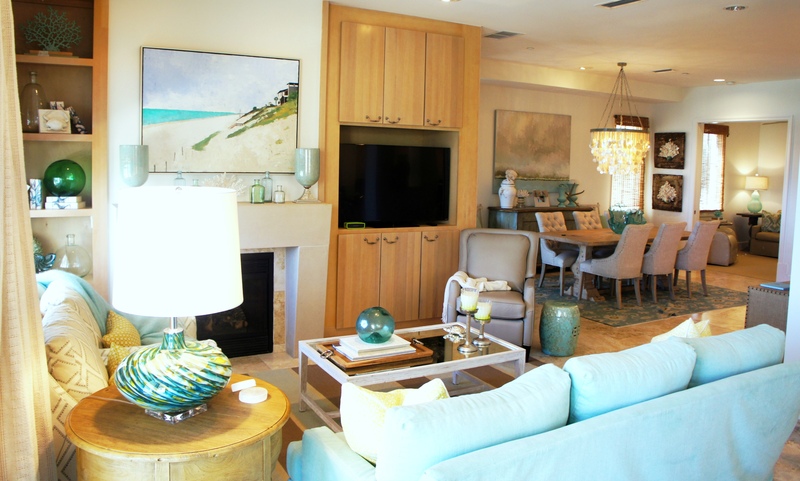 This design takes place in Tre Viste, a 3-unit Condominium in Seagrove, with a secluded beach cottage feel. 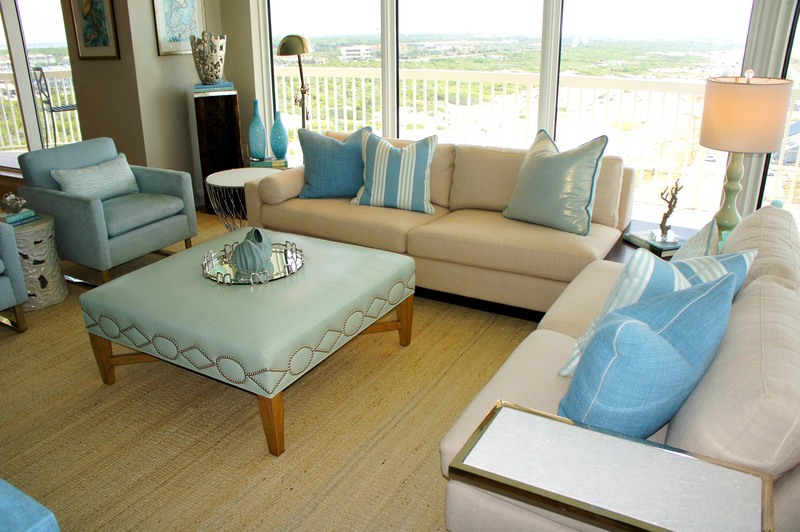 This condo was actually beautifully furnished before, but the sellers could not part with all of their goods, so my clients called upon me to fully furnish the entire place in a matter of weeks! 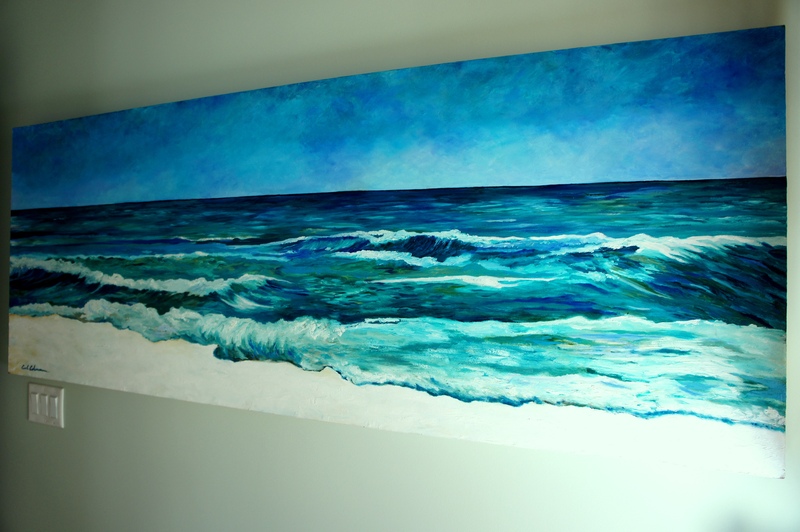 Let me tell you, I had to put on my comfy shoes, for all the shopping up-an-down the Emerald Coast that this required! Luckily I had the help and companionship of my lovely summer intern, Anna! She and I had so much fun shopping together, and we were able to see our design come to fruition in a matter of weeks! This chandelier by Made Goods was the only jewel we were able to keep from the previous design! I found this beautiful trestle table at Beau Home Interiors, and the buffet from Lovelace Interiors! 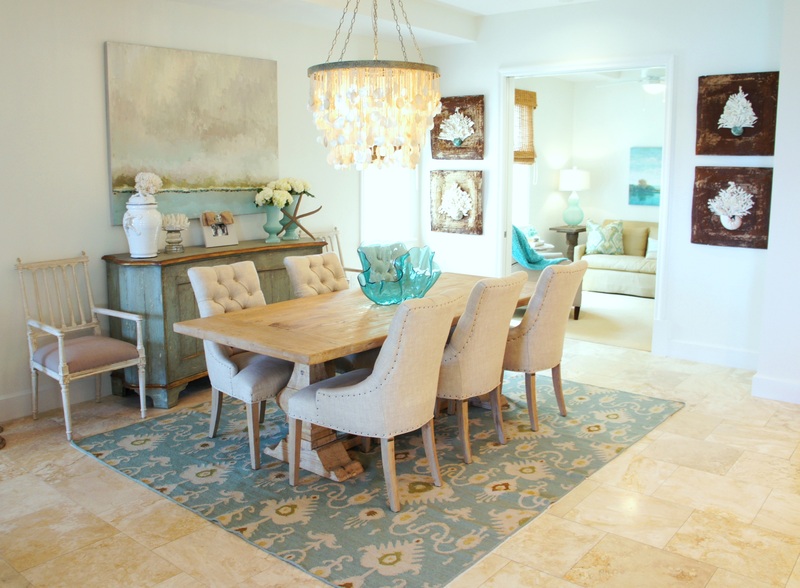 The seascape art is an original painting I found across the street at Design Avenue, and the four antique ceiling tiles, with shell/coral motifs are made by local artist, Lisa Dubreuil! 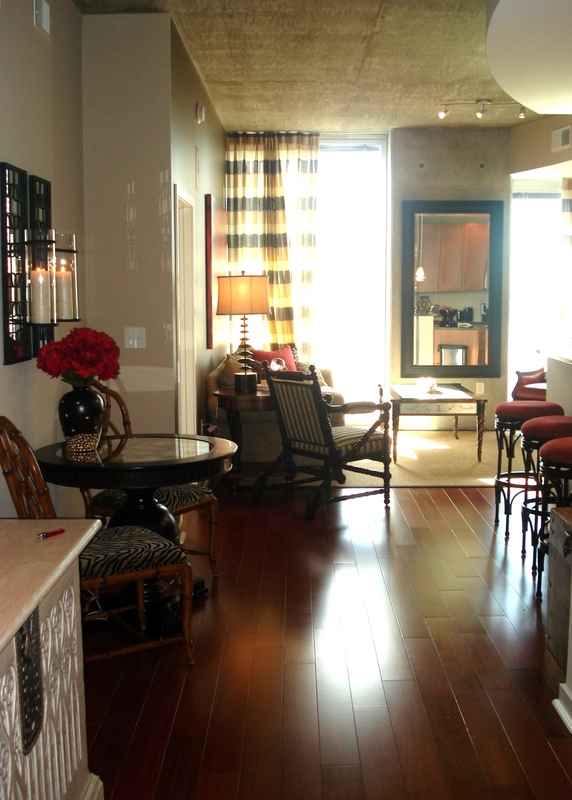 Here is our quaint little living area! 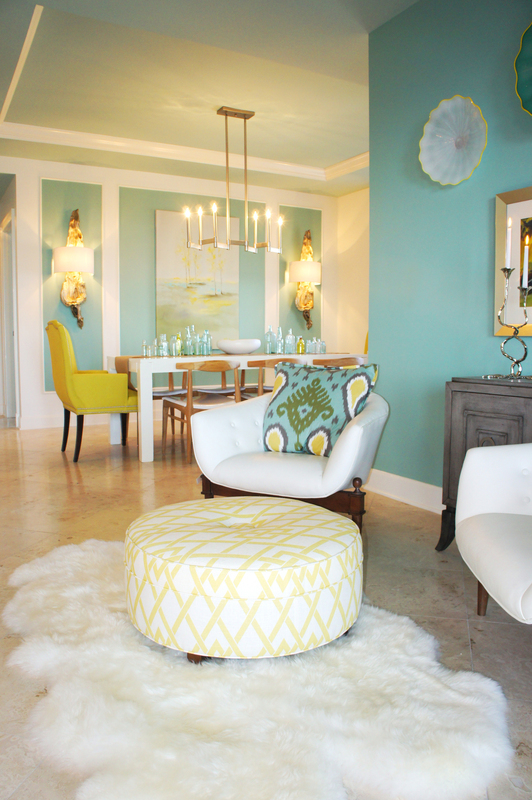 Aqua, chartreuse and taupe blend together beautifully here, I think! 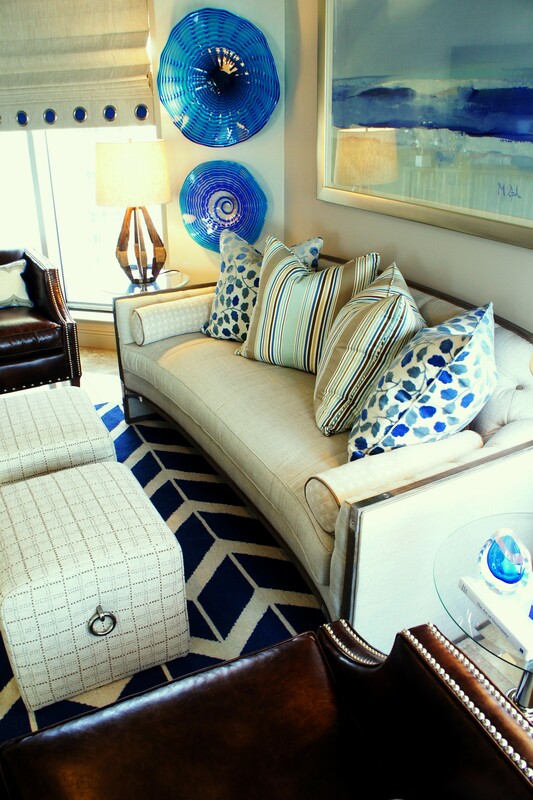 The striped rug is from Design Avenue, the slipcovered sofa and chairs are from Tracery, and the cocktail table and recliner are from Lovelace Interiors! 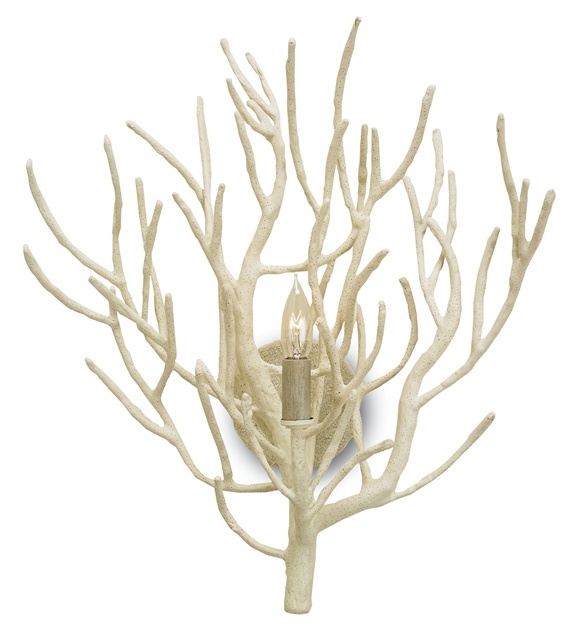 Want an easy way to accessorize your coastal fireplace mantel? Find a variety of colored bud vases, some candles (in this case I used some glass hurricanes), and a great piece of coral! When the clients came to see their design for the first time, I had some bright yellow fresh flowers in each vase! 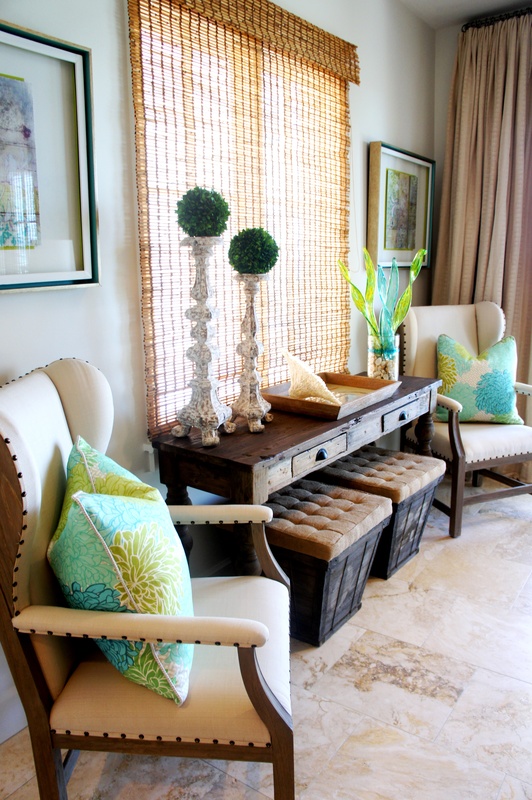 This console can be a desk, or accent table. I flanked the table with some linen and wood wing chairs, and threw in some color with some custom-made pillows, covered in a bright Manuel Canovas fabric. Check out this awesome art I found at Mary Hong’s studio! 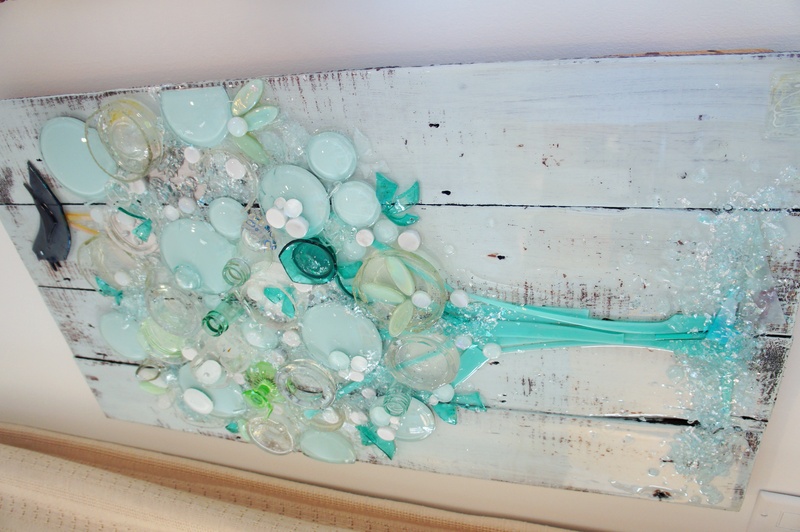 This woman does wonders with glass and wood! In the Master Bedroom, I used a solid oak bed by Restoration Hardware, and lightened it up with some light, natural linens and subtle touches of color. 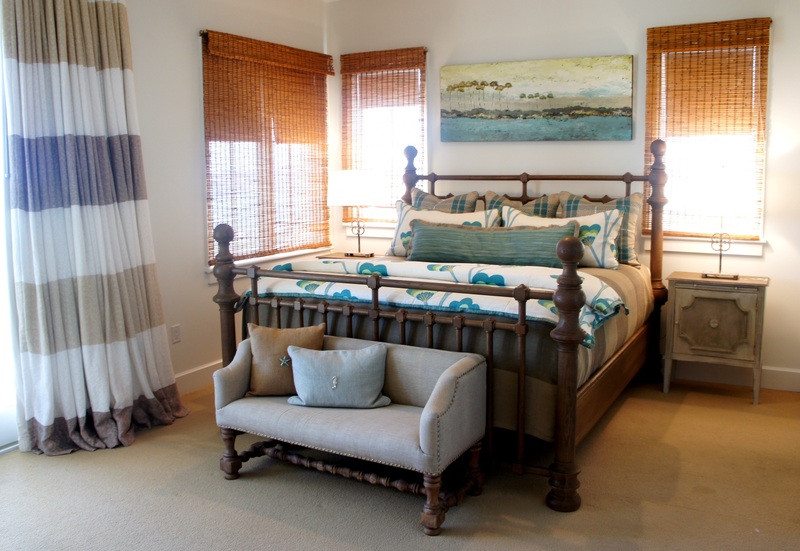 This, the Second Master Bedroom, was a favorite of mine! 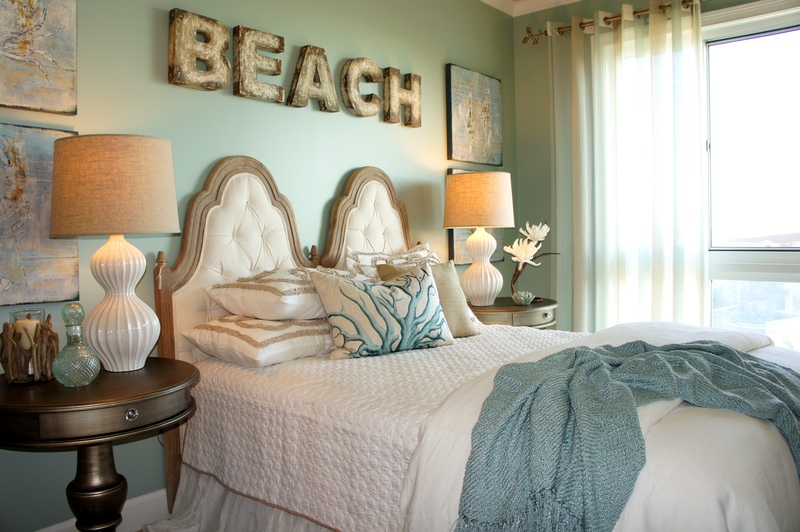 I love the mix of bright white with teal and aqua! 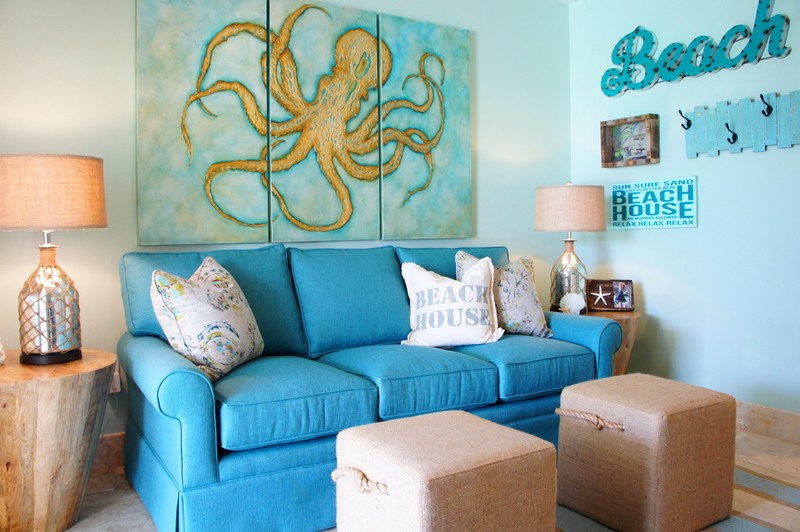 I made some bright, fun euro pillows and a paisley fluffy foot blanket to match the drapes, then happened to find the perfect sealife art while shopping! The bolster pillow is made out of two different fabrics (teal and aqua), and a whimsical jute ball fringe! The cute little turtle lamps were a must-have! I had to show this great piece of art I found in Lovelace Interior’s showroom! 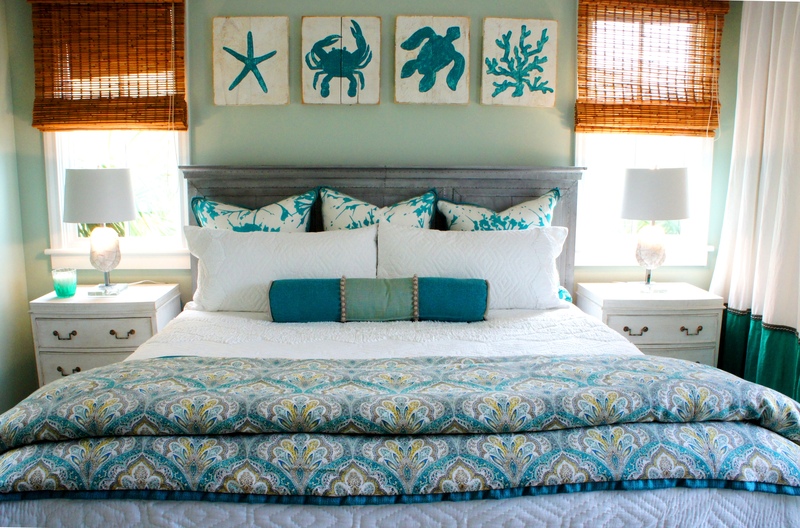 It had the most perfect colors for this room!!! 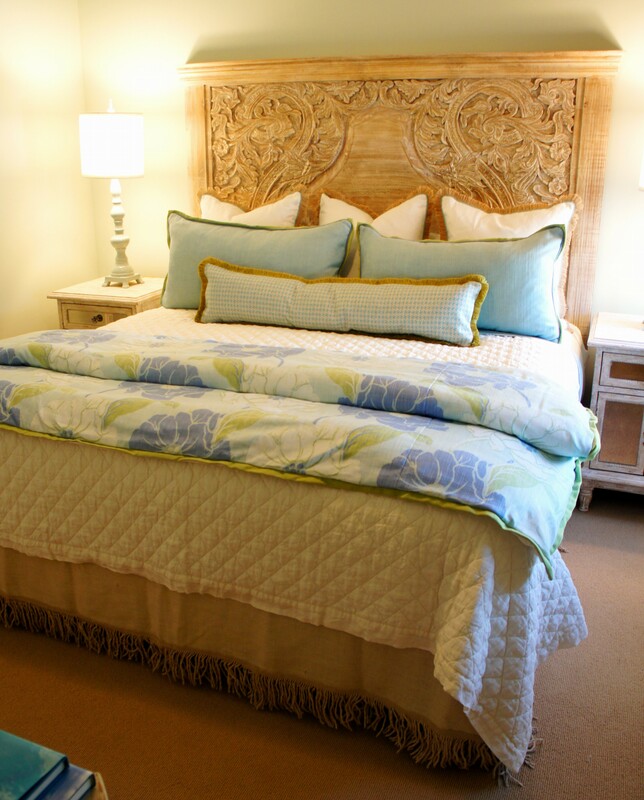 In this room, I used this fabulous carved wood headboard that I found at Nest Interiors, and paired it with some jute fringe euros, and some custom pillows. I absolutely love the aqua, green and periwinkle color combination in this foot blanket! 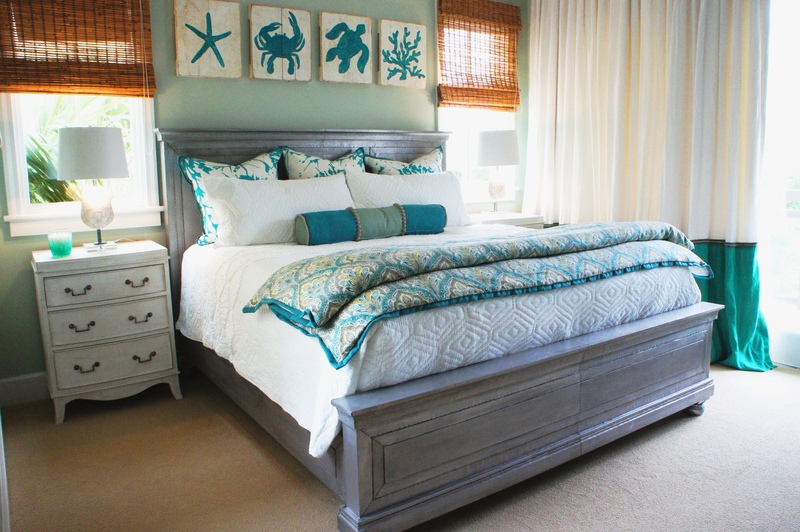 Just a simple, clean comfortable design for a guest room! Finally, welcome to the poolside Cabana!! I went for a brighter, more whimsical design in this room! That’s me, taking pictures! Anna snuck this photo of me. I’m not a photographer, but I try! Here is my beautiful intern, Anna Laneve! 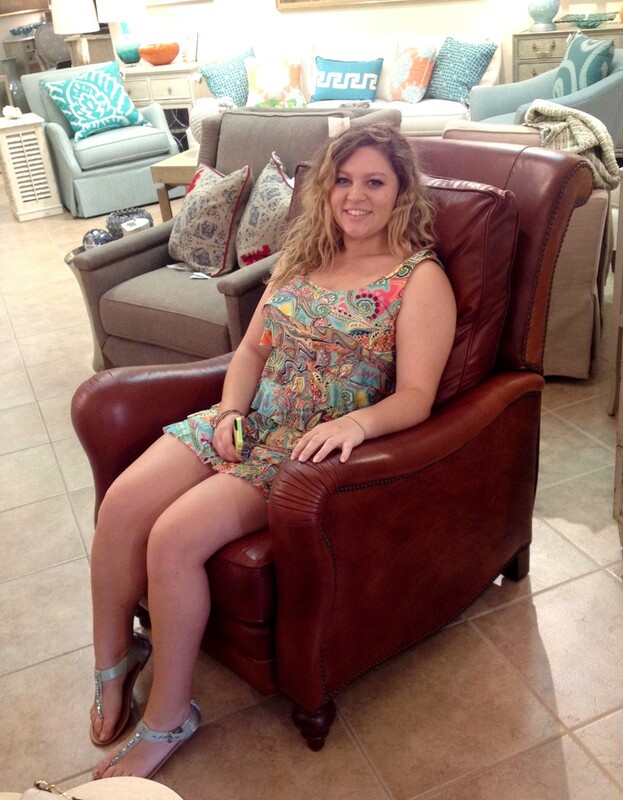 I snapped this while shopping for recliners! We had so much fun putting all this together! Although it was a lot of work, I am up for another challenge like this! 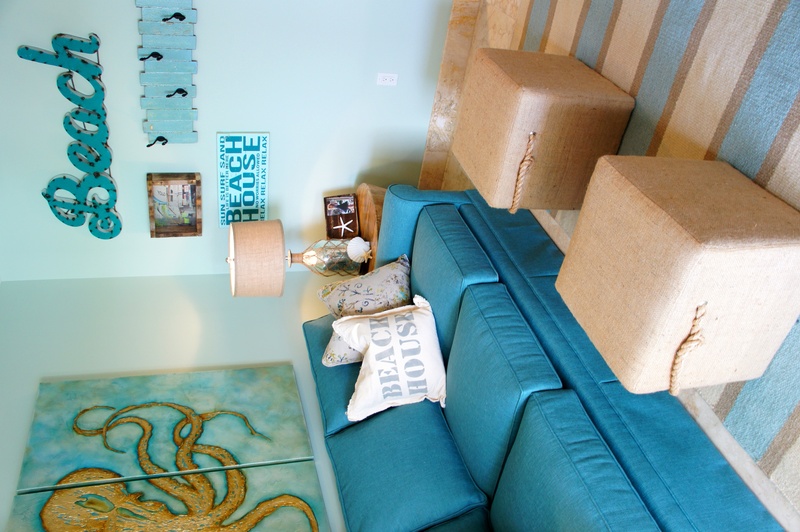 I finished just in time for this family to enjoy their new beach residence for the summer! Most clients want a complete custom design, and are willing to wait, but If anyone is facing time restraints, hire a designer, (hire me! ), to make sure you get the look you want, in the right time frame! 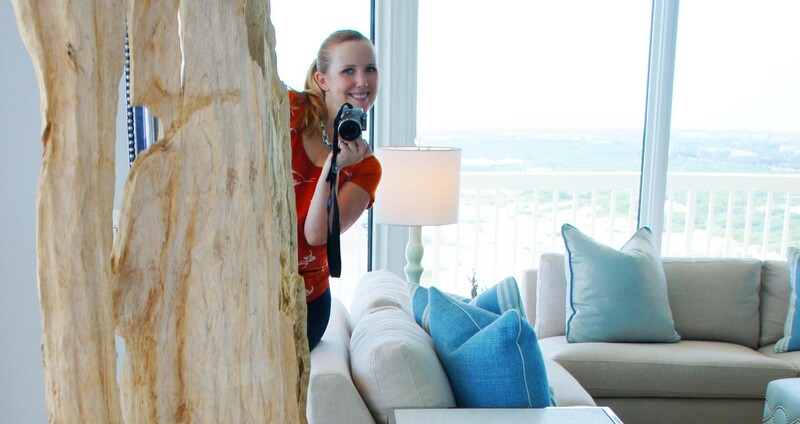 Come and see this fun room I had the opportunity to design for a client’s teenage girl, in their vacation condo! When this client told me their little girl loves pink, I got so excited, because I NEVER get to use pink!! Everything is always blue, blue blue, green, blue, and other variations of this. What did I come up with? An explosion of magenta, coral, and purple, contrasted with pale ice blue! 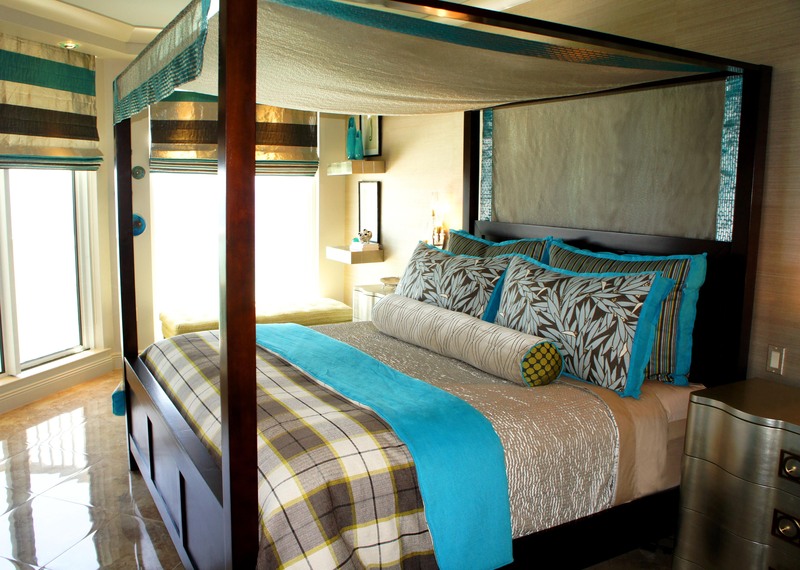 The chrome canopy bed is by Bernhardt Furniture. 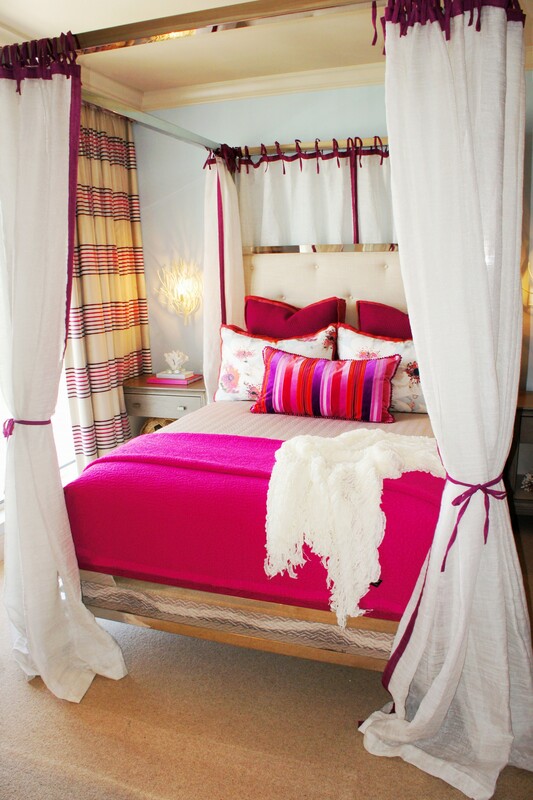 I designed off-white canopy sheers, with magenta trim and ties, for a romantic feel! 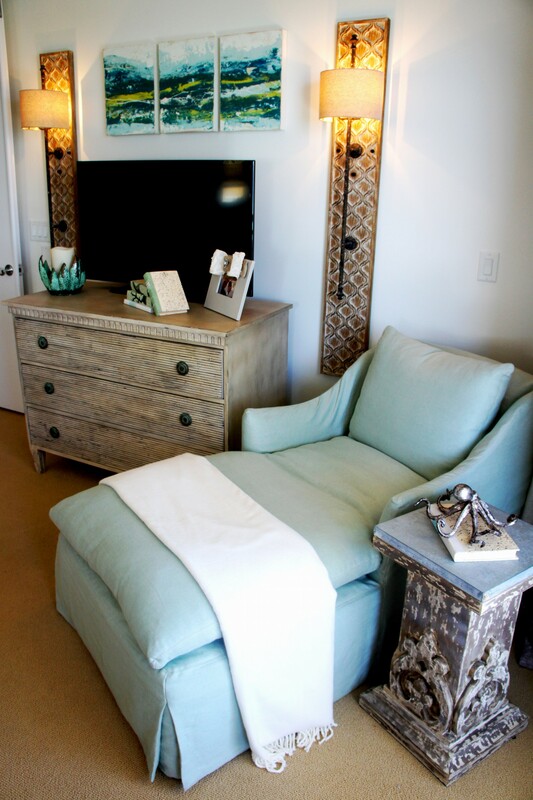 Flanking the bed are two gray nightstands, and some cream Eventide Wall Sconces by Currey and Company. Not only do these sconces look ethereal and free up the nightstands, but they also leave sculptural shadows on the wall, which I love! Eden Amaranth by Romo. I loved all the colors in this fabric, and so it became my color inspiration. From this, I was able to envision the walls in the background blue color, as I knew this pale cool color would allow all the bright pinks and corals to shine! 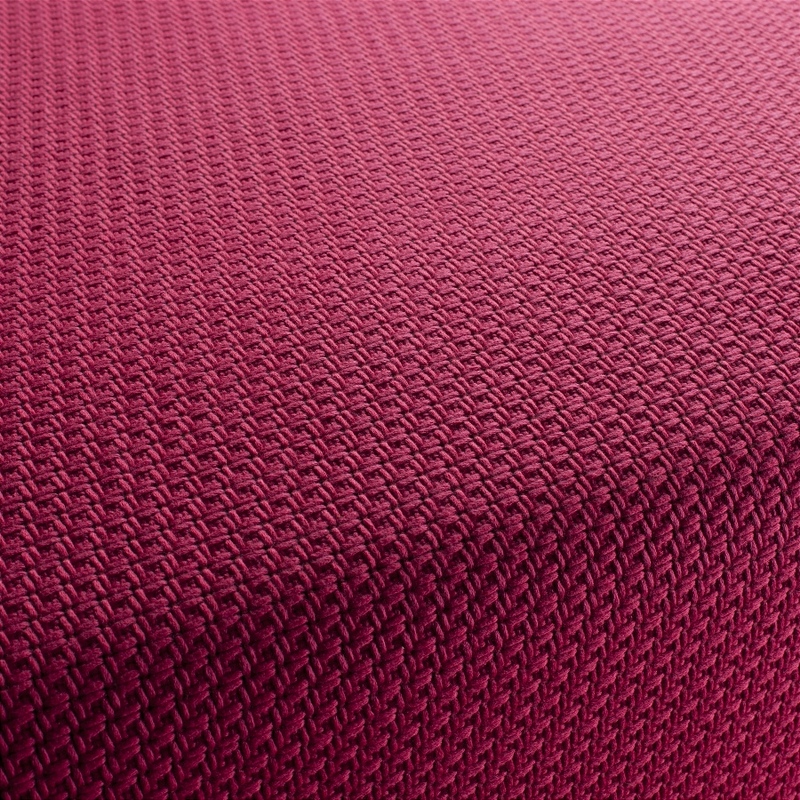 I love to mix textures, so when I found this thick, textured woven pink, I was excited. I knew it would look great as Euro pillows, behind my linen and velvet pillows. 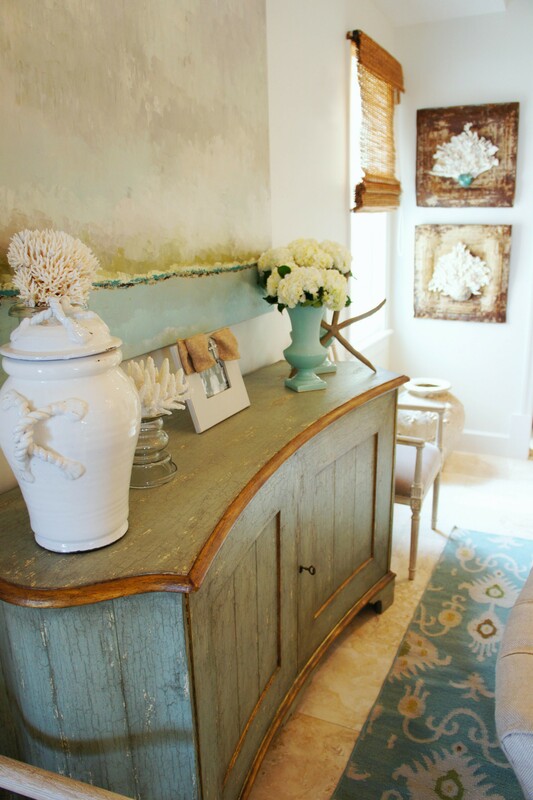 Designing this little room was a breath of fresh air! Being able to use pinks and corals freely had me feeling liberated as a designer! It was FUN, even though it was only a small room. I am now in the mood for Spring! Beautiful flowers, clear blue skies, and Easter dress shopping! 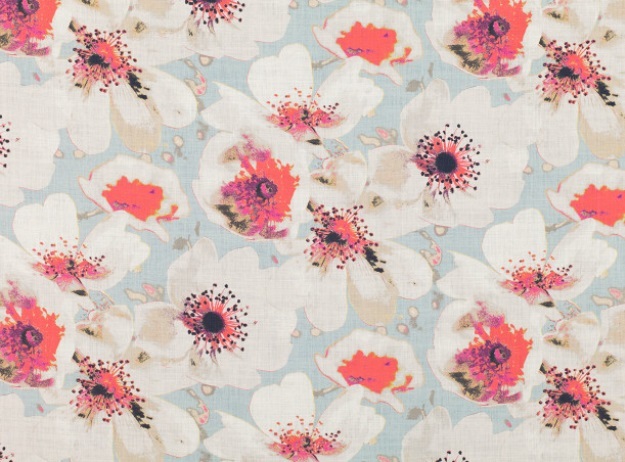 Who is up for making me a dress out of this Eden Amaranth fabric? Anyone? 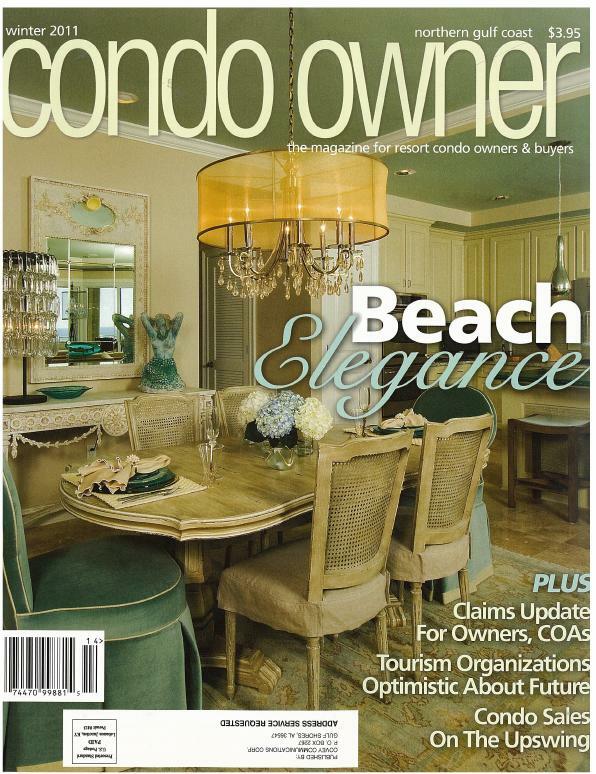 This project took place inside the St. Thomas tower at Silver Shells in Destin, Florida! 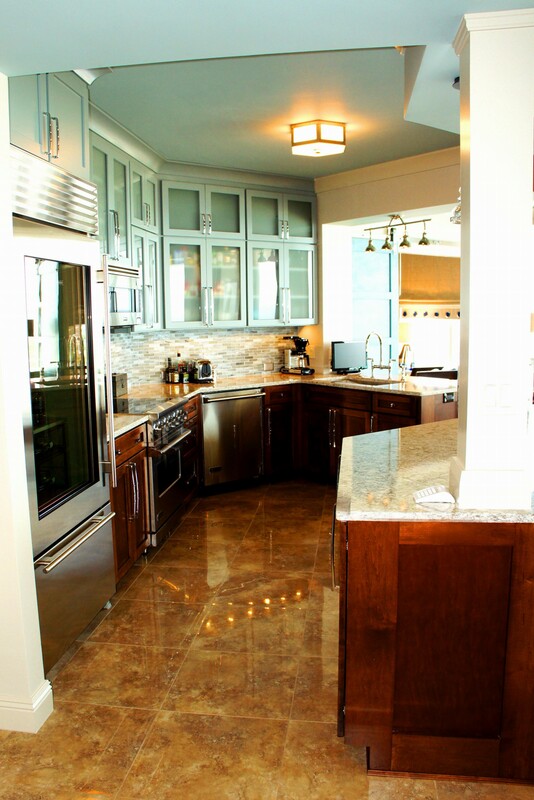 We aimed for a modern/transitional style, with a soothing, masculine color scheme. 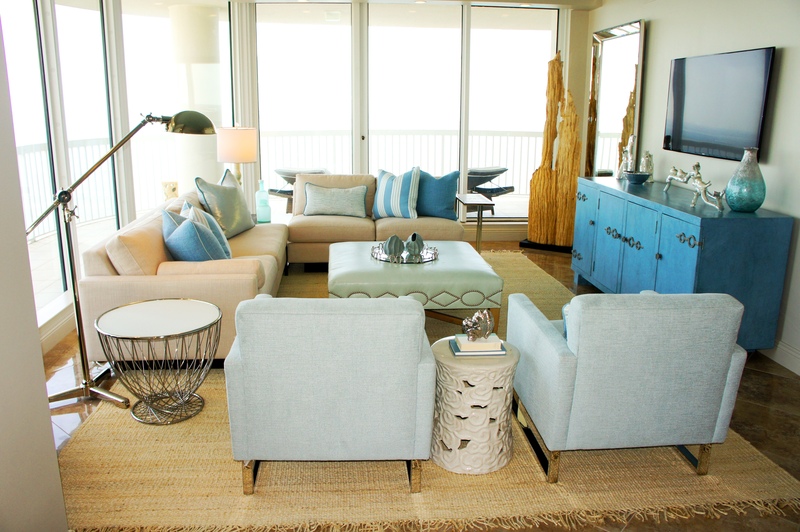 Neutral taupe, hemp and gray color tones were livened up with the occasional splash of coastal ice green and powder blue. You may recognize this unit from one of my previous posts, titled, “Diary of an Install” (click to read! ), where I chronicled the ups and downs of installing a custom design. I know I promised professional photos, but I’ve been busy! My home-made photos will have to suffice for now! 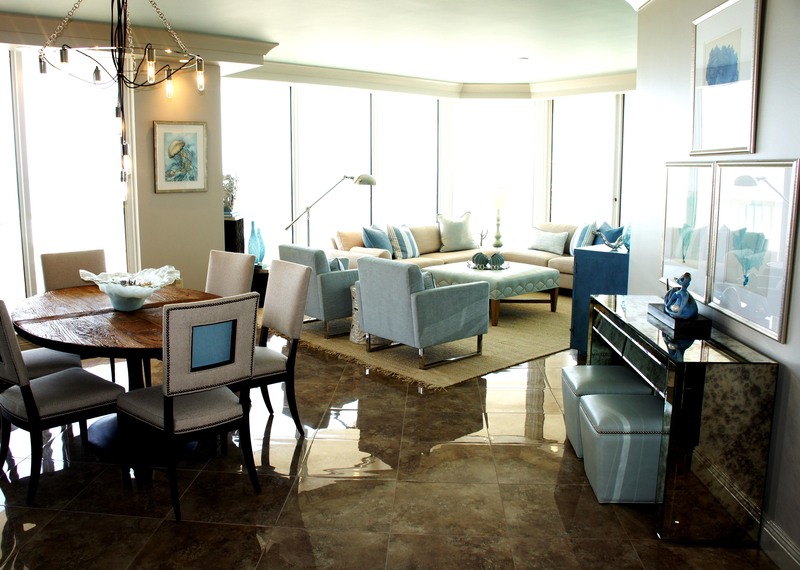 I balanced sleek chrome and high gloss floor tiles, with natural, coastal elements, such as a jute rug, soft linens and a large, custom television console, with an antiqued powder blue finish (Thanks for the beautiful craftsmanship, Armored Frog!) 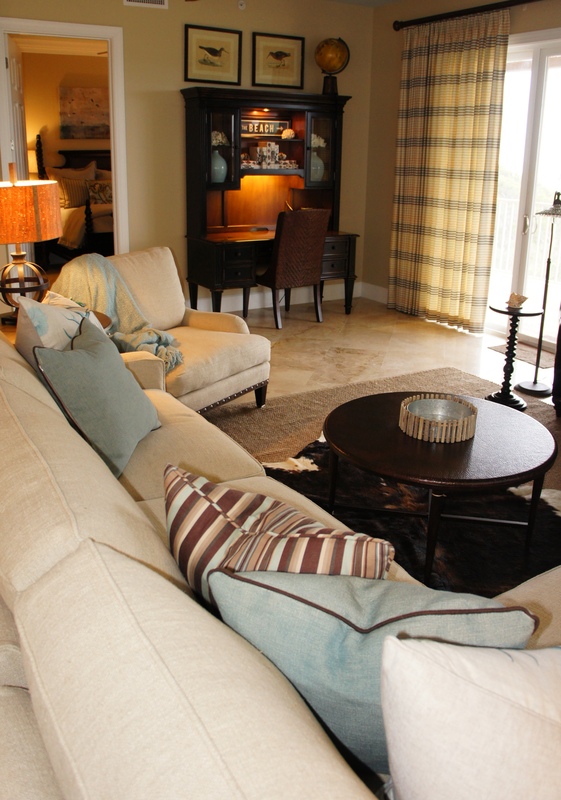 I opted for a low, modern sectional layout, with a seat-height corner table, which enabled a more open feel. 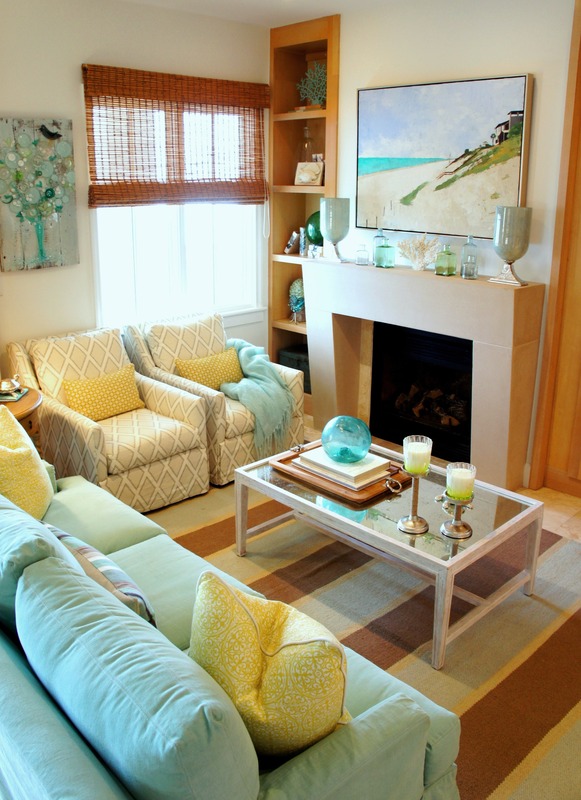 This optimized on the wrap-around view of the beach, while still providing comfortable seating for entertainment, or conversation. 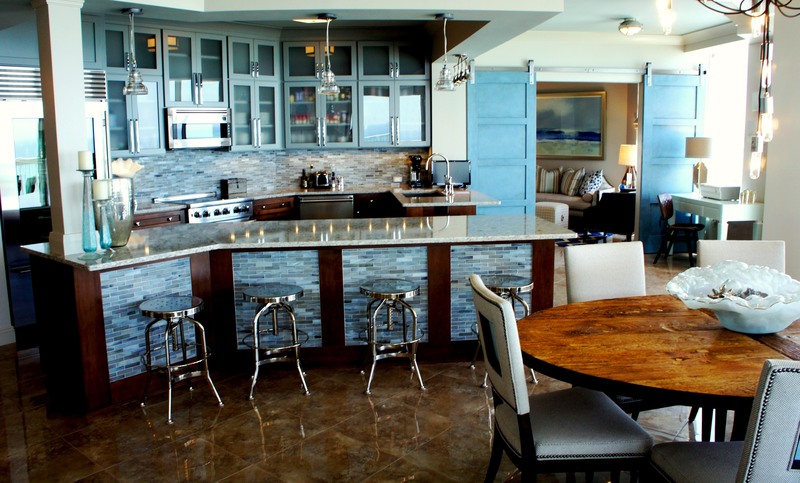 This Living / Dining / Kitchen area has an open layout, with unification of the different areas through color, texture and style. 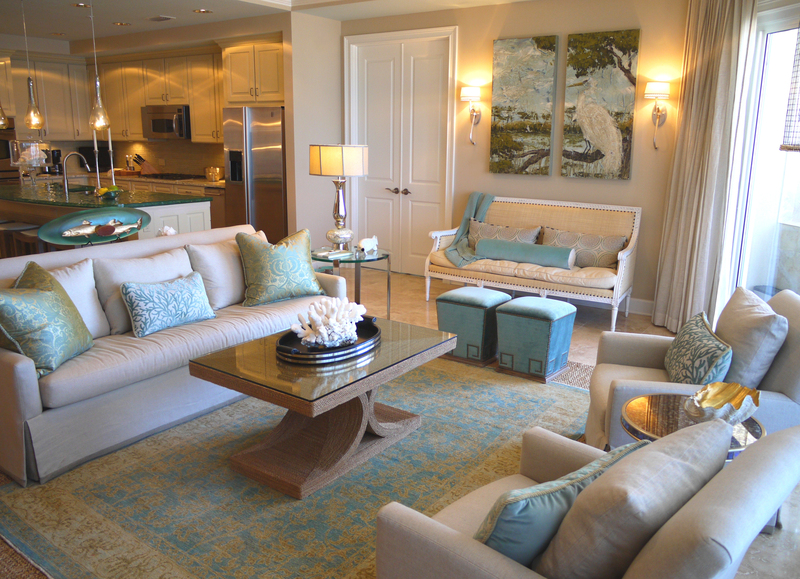 Having a sectional, with a low back and open corner allows the coastal seascape backdrop to shine! Having a large leather ottoman, versus a cocktail table allows for more versatility and softness/comfort. You can add a tray if you need a place to set a drink! This square ottoman is made by Lee Industries. 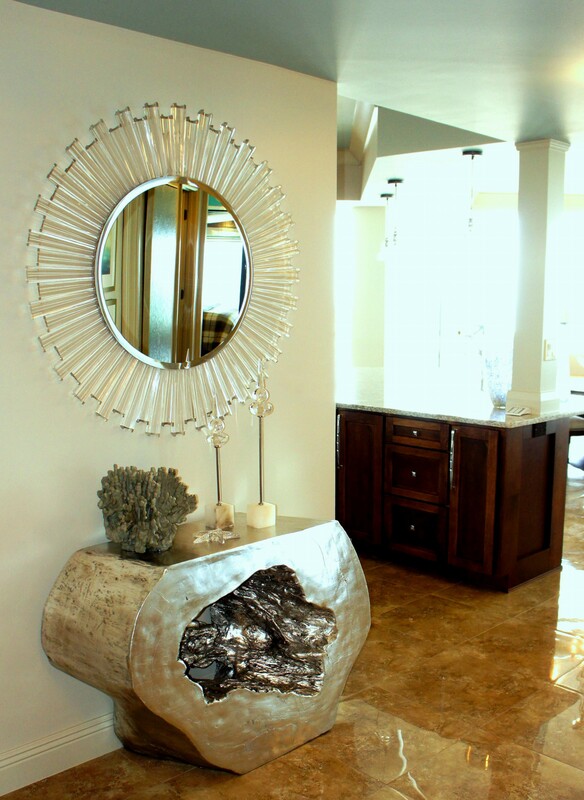 This angled wall was the perfect spot for a multi-functional mirrored console. It can be used as a server for the dining area, but I added the stools so that there was extra seating during a meal or a place to sit and do work. 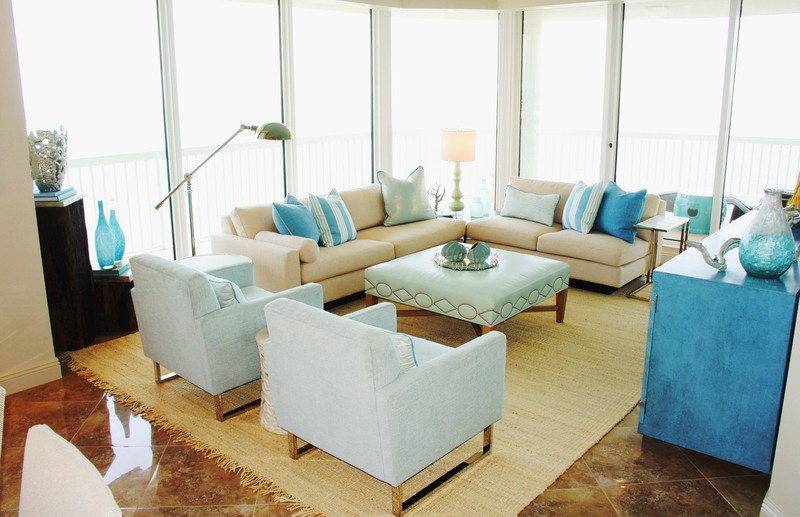 The ottomans can be easily utilized in the Living Room as auxiliary seating for kids! 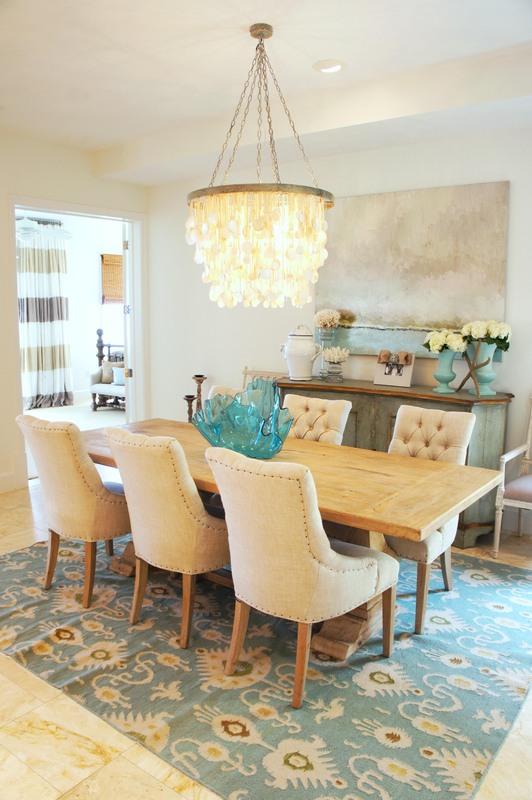 The warm brown hue of the reclaimed wood table top contrasts beautifully with the blue accents in the room! We really opened this kitchen up! 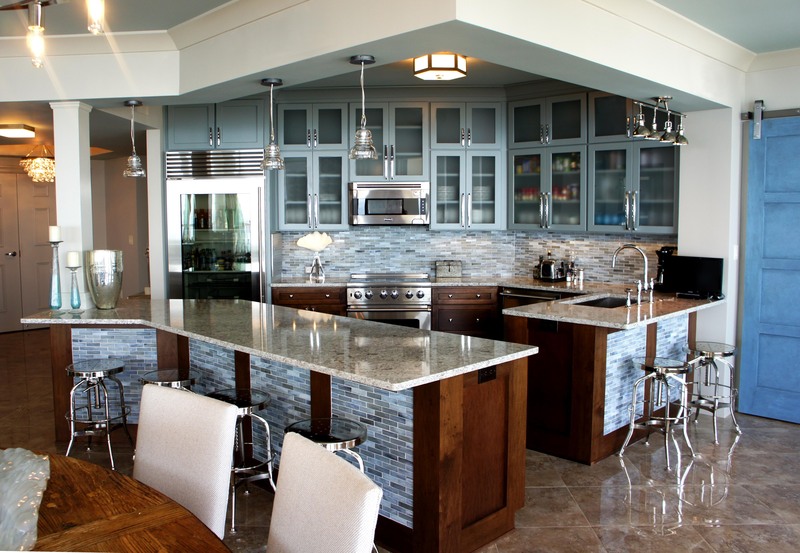 The cabinets are two-toned, with a custom-painted blue gray finish on the upper cabinets, and a walnut stain on the bottom. I tied all the colors in the room together with this glass tile backsplash! 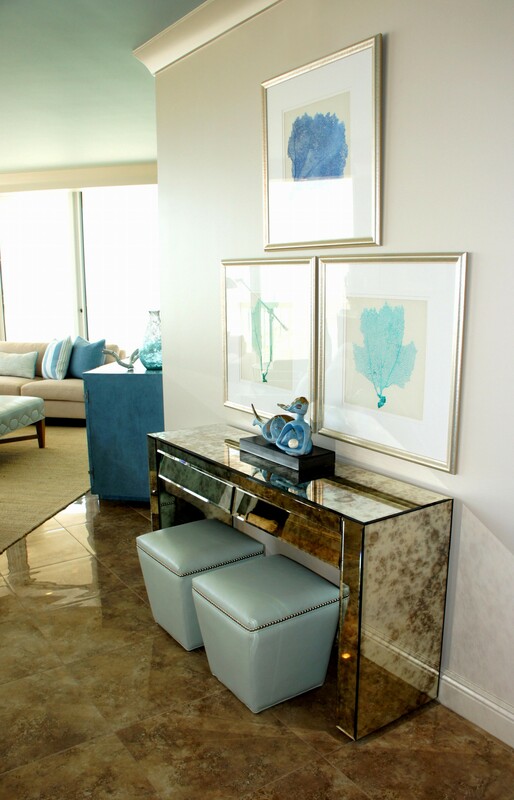 When you enter from the private elevator, this modern acrylic mirror and resin-cast silver leaf console table is what greets you! I wanted to make a statement in this small space! 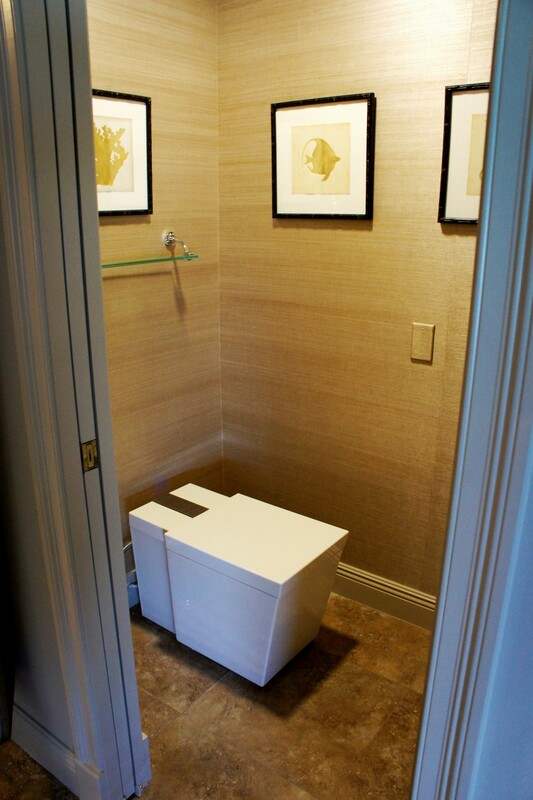 Speaking of the entry, take a look at this fabulous wallcovering technique! 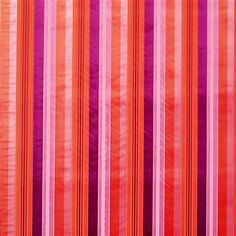 The walls are covered in a striped Omexco Mica wallcovering. 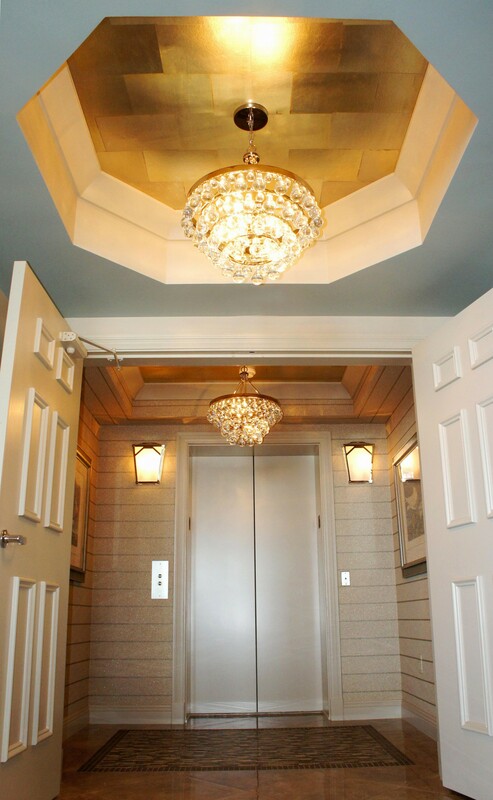 The ceilings are covered in an iridescent gold leaf block paper, by Phillip Jeffries! The tile inset visually balances the high interest we created on the ceiling. 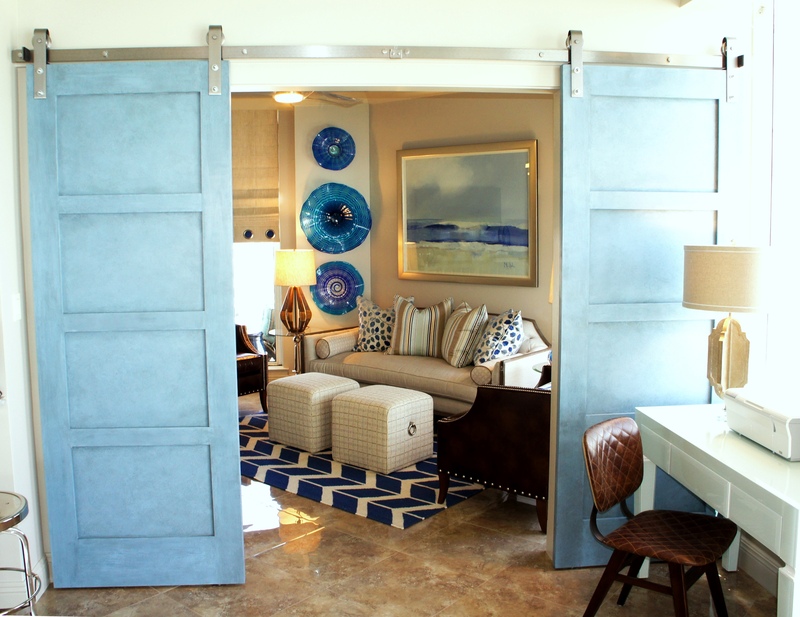 These custom barn doors, leading to the Den, add a touch of modern, and a touch of coastal charm! 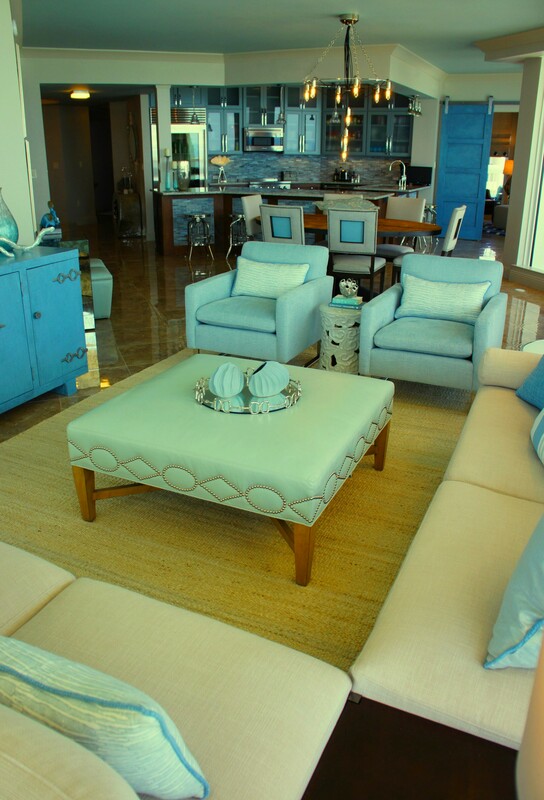 I had them finished in the same powder blue as the entertainment console in the Living Room. Peeking through the barn doors, is a surprise burst of cobalt! 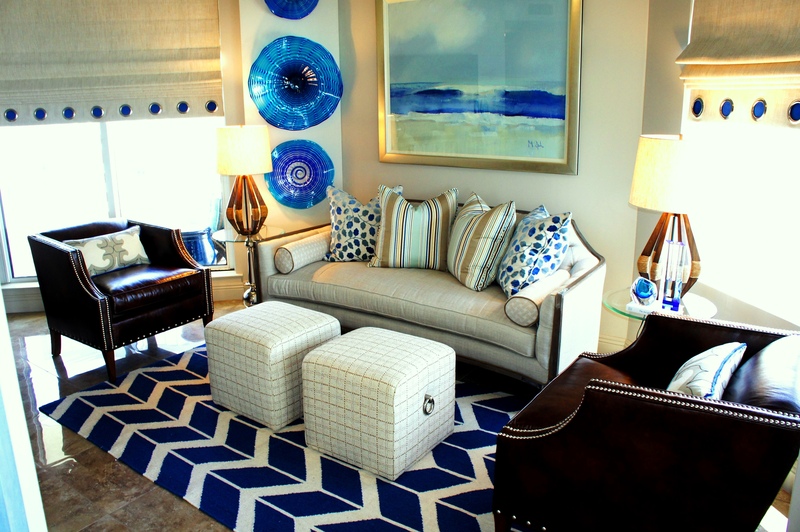 I wanted this room, which overlooks the bay, to have darker blues, but still blend with the rest of the unit. 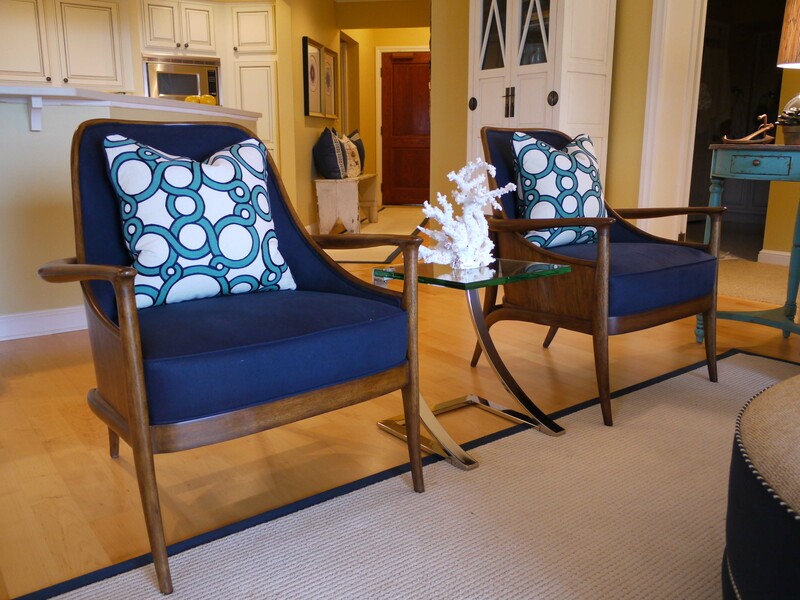 The Settee is by Caracole, the club chairs by Sam Moore, the upholstered stools by Vanguard Furniture, and the chevron rug by Surya. The brown leather and polished nickel nail heads on the club chairs counterbalance the brown wood and polished nickel brackets on the settee! 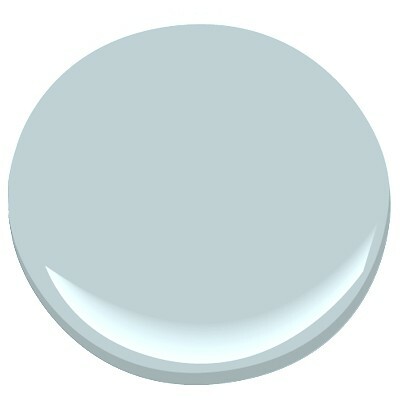 I wanted the large roman shades to remain mostly neutral, but I felt they needed some color and interest. Instead of doing a typical accent color band at the bottom, I chose to use nautical grommets on a reveal band at the bottom. Behind the grommets, I designed a cobalt liner, which created the hint of color I wanted. 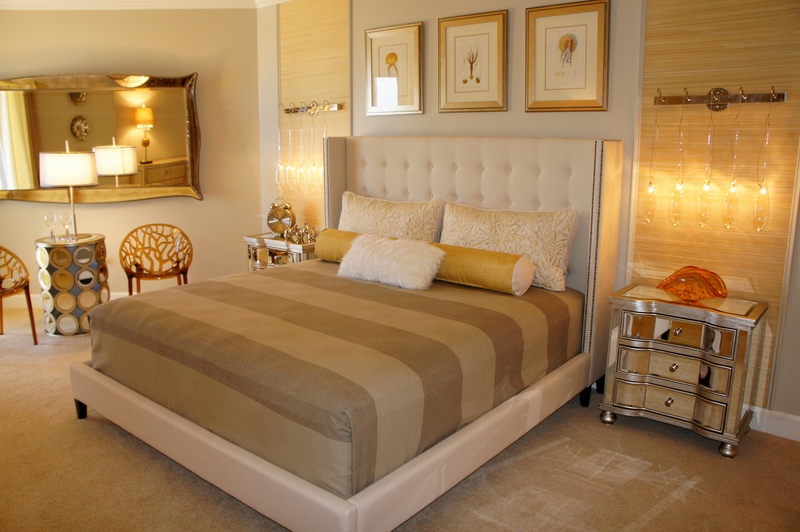 The Master Bedroom maintained the feel of the rest of the condo, with a little more mood and intimacy. 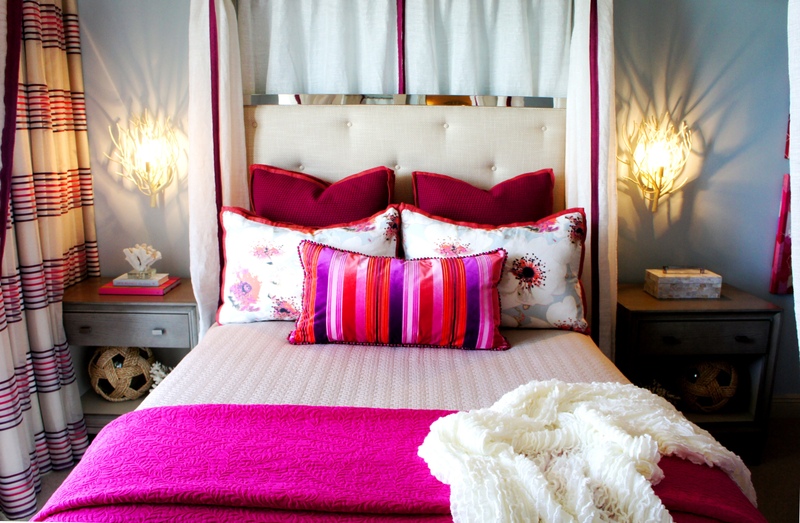 Adding a sheer panel to a canopy bed is a quick, easy way to create intimacy and drama in a bedroom! In this case, I chose a taupe shimmering sheer fabric, and banded it in a turquoise sheer, with a small geometric pattern on it. 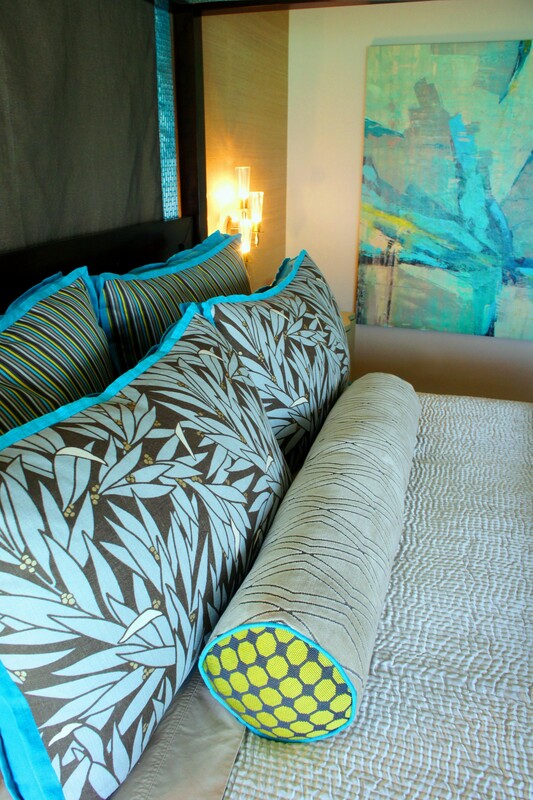 I like to mix patterns and textures when designing custom bedding. 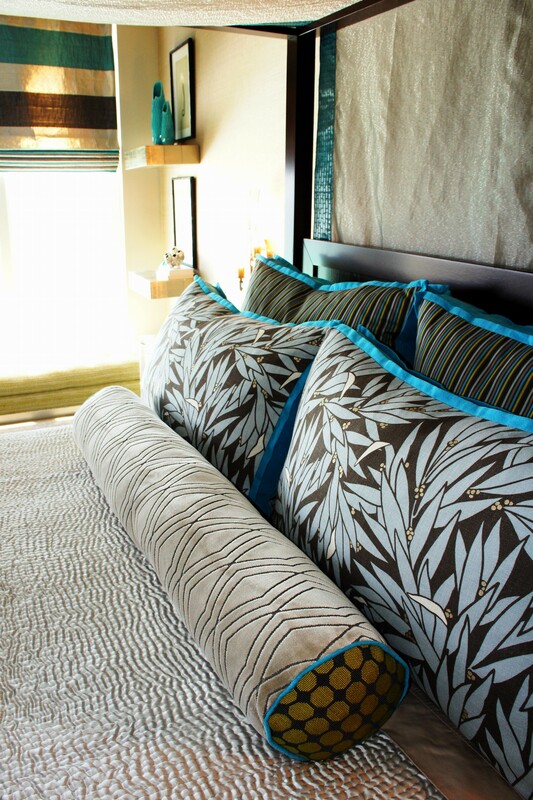 A botanical fabric works great with stripes and geometric patterns! 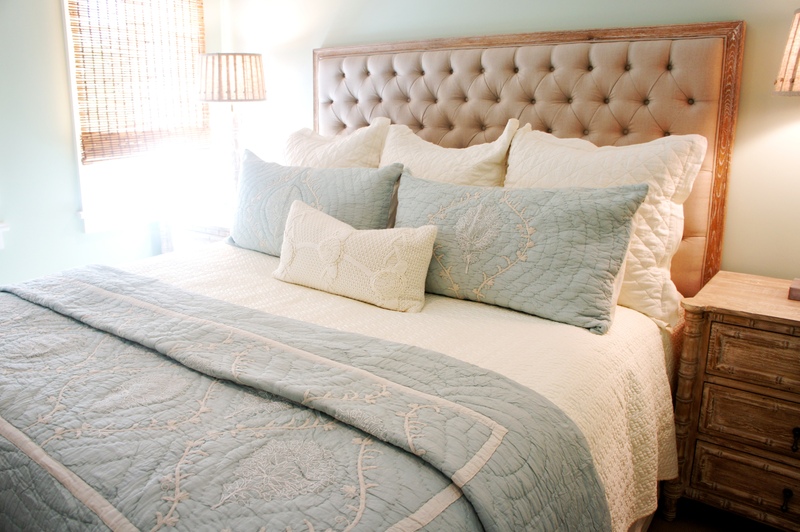 Linens can be mixed with satin, velvet, and shimmering linen blends, with metallic threading. 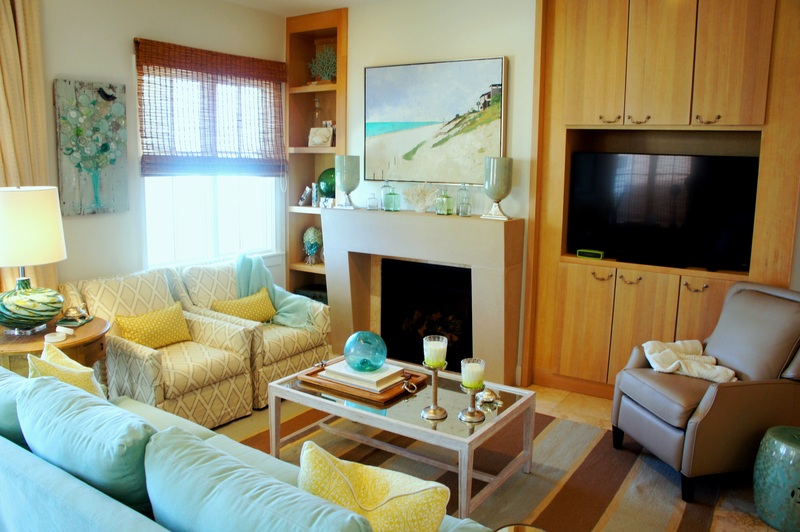 The green accents in the room are minimal, but effective! I thoroughly enjoyed the opportunity to gut this Master Bathroom and start over from scratch! Here is my drawing for the new Master Bathroom vanity. The wide horizontal band of micro mosaic tiles wrapped all around the room. 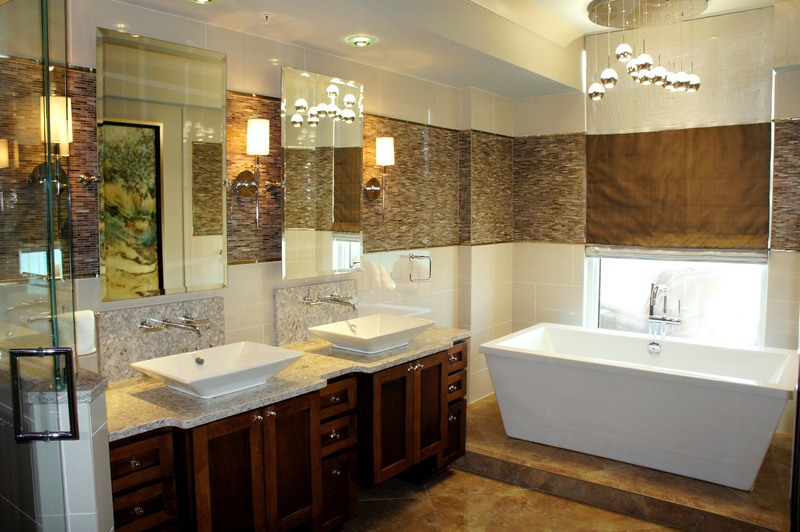 We were able to put in a gorgeous soaker tub, and a glass-enclosed steam shower! Here is the final result!! I couldn’t be more pleased! 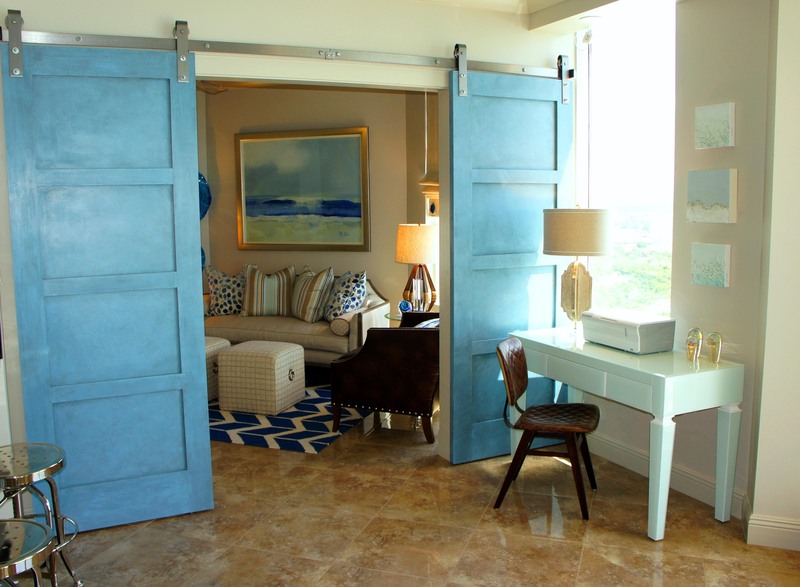 The client wanted a balance between high tech/modern, and transitional. I chose the stained cabinets to keep the design warm and grounded, and added polished nickel accents, unique plumbing fixtures and modern lighting. 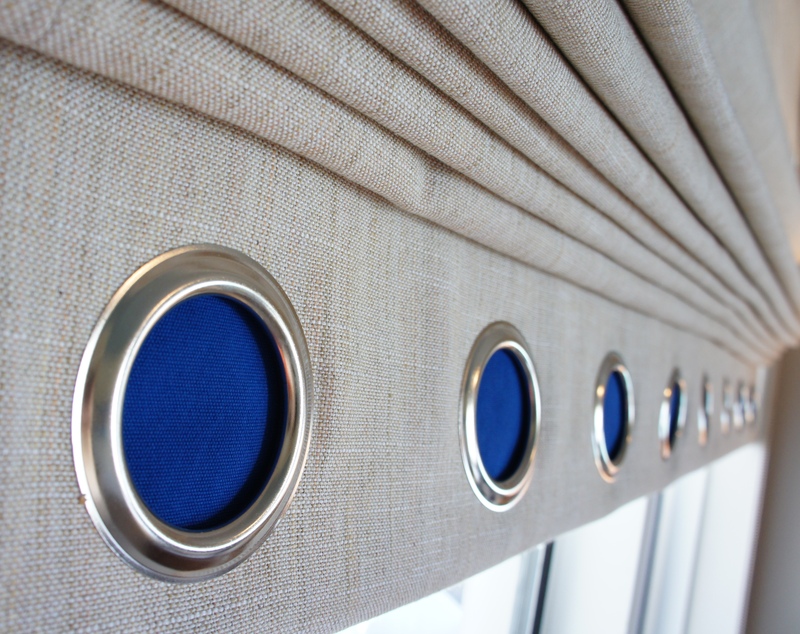 Here you can see how I designed the roman shade so that the wide accent band continued around, unobstructed, when the shades are down. 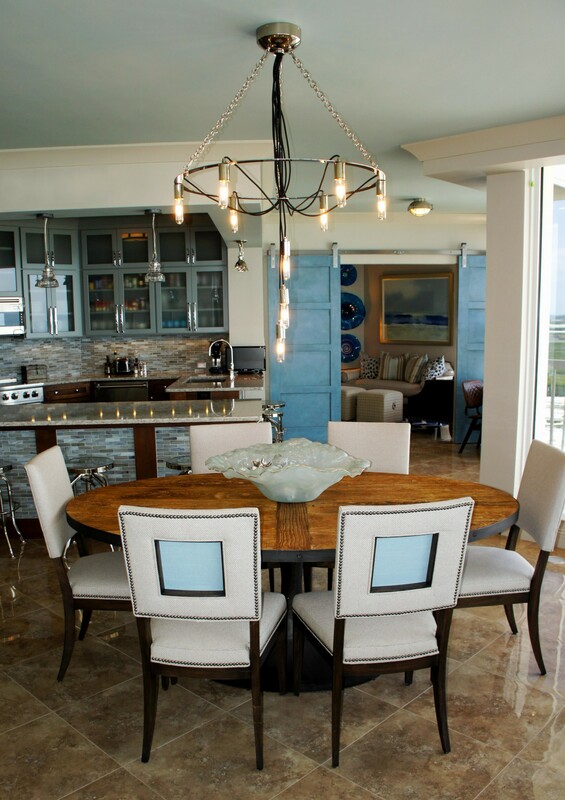 The raindrops chandelier brings in an organic, but modern element! The horizontal band continues on through the steam shower. 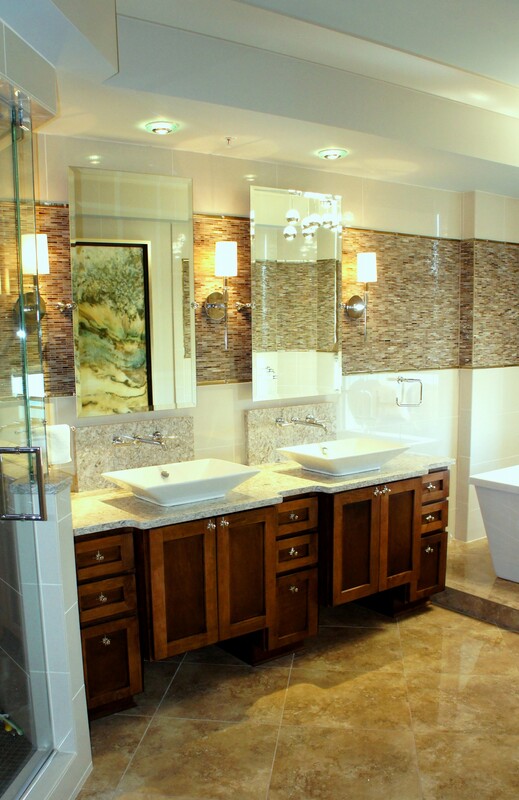 The shower & vanity are separated only by a pony wall and glass. 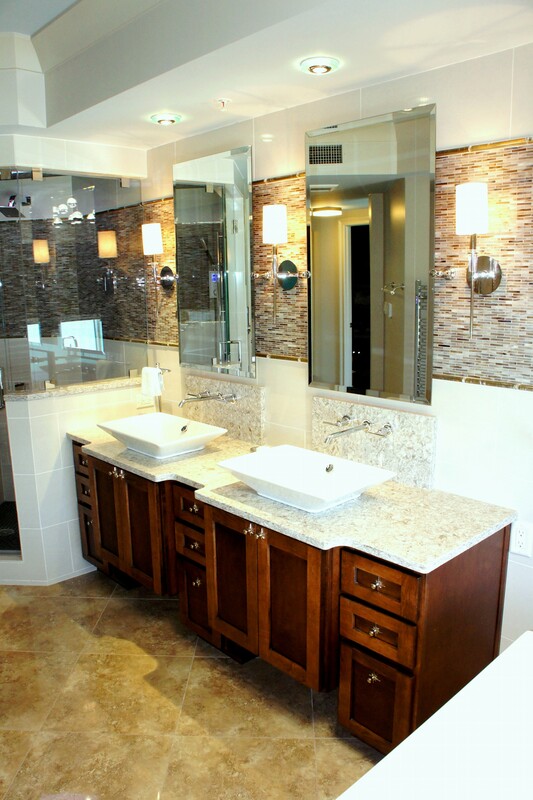 I tried to do everything possible to make this bathroom feel more spacious! 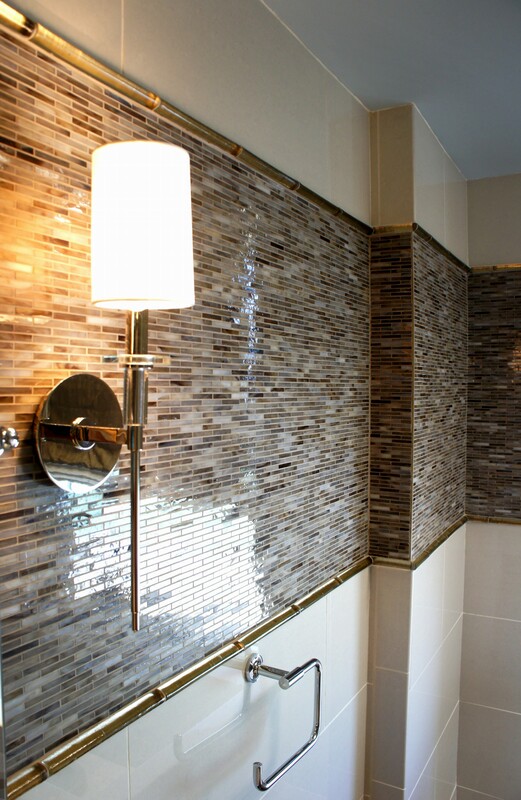 The horizontal band of tile is transitioned into the sleek porcelain tile with some taupe glass pencil trim. 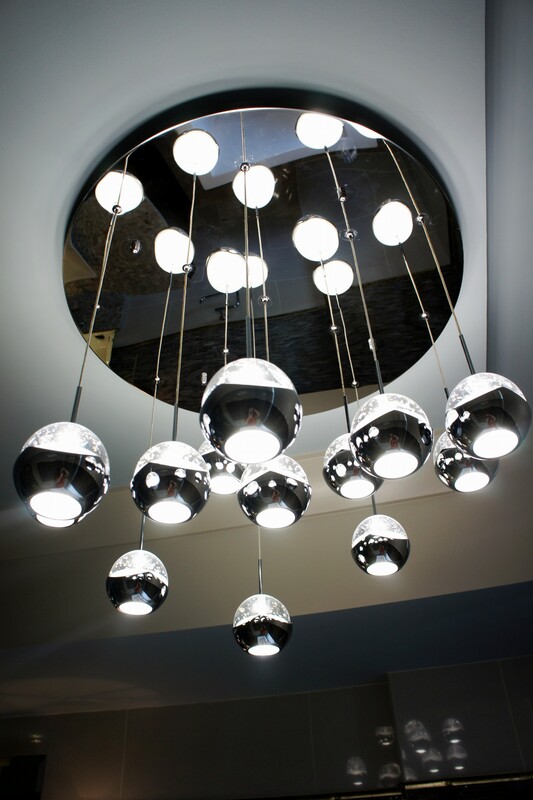 Here is the chandelier I used, which is the “Ice” 13-light pendant manufactured by Eurofase. This might be the first toilet I’ve ever felt the need to show off. It’s so pretty! This toilet opens/closes automatically, plays music, heats up, and all sorts of fancy stuff! I got a kick out of how many workers it startled, as they were in there to hang pictures, etc. I covered the walls in a warm gray and silver grass cloth. Stay tuned for a post about the daughter’s room! 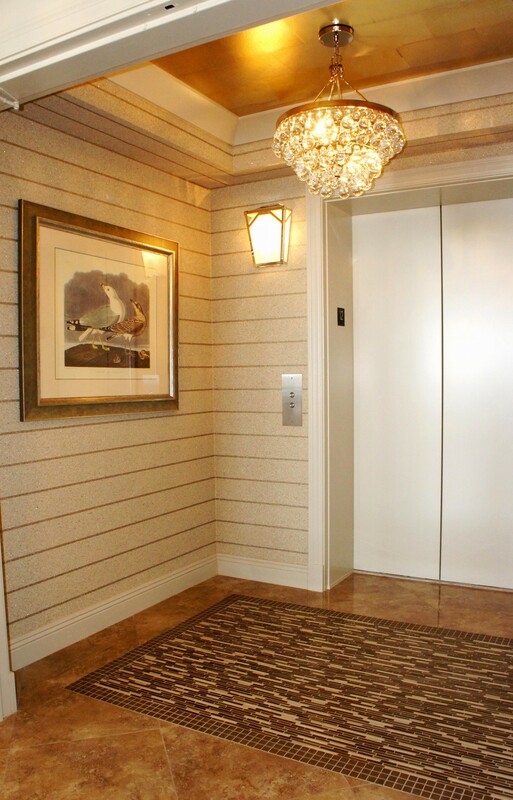 It is so different from the rest of the condo, that I want to post separately! Thank you for visiting, and please follow!